Maybe the best connection for children is the visions and dreams promised in verse 28. Identify dreams as possibilities and ideas about what could be. Martin Luther King’s “I Have A Dream” speech illustrates the importance of a dream in shaping life for both individuals and communities. According to Joel such dreams are gifts from God and therefore should be valued and worked with. Two well known hymns that explore dreams and are very child accessible are “Be Thou My Vision” and “Open My Eyes That I May See.” Before singing the latter put the chorus into your own words. Clarify “illumine me” as give me your vision, let me hear your message, help me claim as my own your dreams for me and for the world. There are so many random praises in this psalm that it is hard for children to follow. They are most likely to hear one or two that make sense to them. One way to focus their attention on these phrases is to provide them with a page with the words of all or part of the psalm printed in the middle. (Choose a translation such as Today’s English Bible which uses words children understand more easily.) Invite children to illustrate the psalm by drawing in the margins things they read about in the psalm or that the psalmist makes them remember with praise. As they leave the sanctuary, take time to talk with those who worked on this project about what they drew and/or post their artwork on a special bulletin board near the worship space or outside your office door. Tell the back-story before reading this text. Invite listeners to imagine Paul sitting in prison in Rome knowing that he will probably soon be killed and writing his young friend Timothy whom he helped as Timothy started work as a minister. Then read the message thoughtfully, imagining yourself writing the letter, pausing at points to search for the right words for what you want to say. In Charlotte’s Web, by E. B. White, Charlotte the spider speaks shortly before her death to Wilbur who she mentored very much as Paul spoke to Timothy in this passage. Click to http://storypath.wordpress.com/2010/10/08/lectionary-links-sunday-oct-24/ to get the details of this and check out a very useful new website connecting each lectionary text with a specific piece of children’s literature. Two basic truths underlie the meaning of this story: God loves us and we are all sinners. The Pharisee understands only one of them – God loves me. He sees only his strengths and good deeds and tells God all about them. It is a one sided conversation. The tax-collector however understands both of them. He is well aware of his weaknesses and sins. (Lots of people point them out to him regularly!) If that was all he knew, he wouldn’t be at the Temple at all. But he also knows that God loves him in spite of his sins. So he comes to God to confess and leaves OK with God. To give the tax-collector’s prayer a physical reminder, put each truth in one hand then fold the hands together in prayer. Either use your own hands or invite listeners to use their hands. In either case, hold one hand palm cupped up to hold the truth that God loves us. Briefly describe God’s creation of each one of us with our special gifts and talents. Keep that cupped hand in place while raising the other hand up in the same position to hold the truth that we are each one of us sinners. Move your hands up and down in relationship to each other to note that on some days we feel more loved and lovable and on other days we feel more sinful. Then fold the hands together as if in prayer. Jesus tells his listeners to be honest with God. When we come to God honestly admitting our sins and trusting that God loves and forgives us, we are OK with God – and also OK with ourselves and the people around us. Instruct people to look at the other people all around them in the sanctuary - the people in their families, their friends, the people they know who they are but aren’t friends, and the people they do not know at all. Then tell them that every one of those people is a sinner. Each one says and does things that hurt others, themselves and God. Sometimes they mean to do those things. Other times the mean words and deeds just pop out. Even they are surprised at what they have done. Then direct everyone to look again. Point out that God loves every one of the people in the room. God made them and knows them, even the awful things they do, and God loves them. When we are honest with each other and with God about both the awful things we do and God’s love for each one of us, things work out OK.
Names that belittle – Shorty, Four-eyes, Pipsqueak, etc. Read this scripture as reader’s theater with male readers. The Narrator may read from the lectern with the other 2 at center front. Or, all three may stand center front with the Narrator in the middle of the other two. Or, the Narrator may be in the lectern, the Pharisee at center front and the Tax collector off to the side. 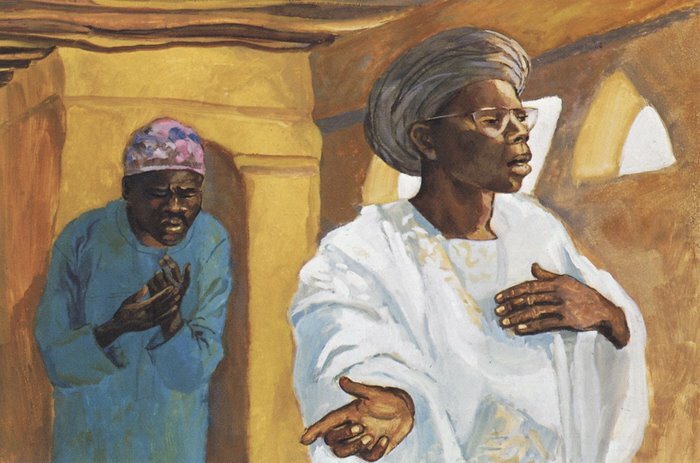 Narrator: He also told this parable to some who trusted in themselves that they were righteous and regarded others with contempt: “Two men went up to the temple to pray, one a Pharisee and the other a tax collector.